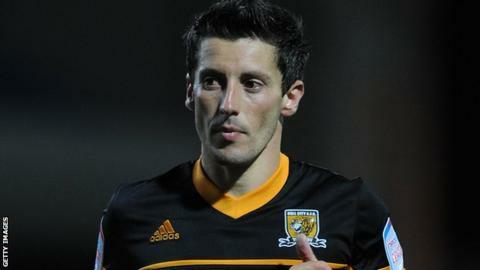 Hull City produced an impressive comeback to beat Leeds United at Elland Road for the first time since 1987. The hosts went ahead after seven minutes when Luciano Becchio scored from the penalty spot after Joe Dudgeon fouled Leeds forward El-Hadji Diouf. But goals from Ahmed Elmohamady, Abdoulaye Faye and Robert Koren secured a thrilling win for Steve Bruce's side. Andy Gray headed in an injury-time consolation for Leeds but the damage was done. The result leaves Hull fourth in the table, level on points with Blackpool in second. Leeds are in 13th place. It was another night of midweek disappointment for Leeds, who have now won just three of their past 22 midweek matches. There had been hope for Neil Warnock's side when they snatched the lead from the penalty spot. Becchio finished decisively after Dudgeon tripped Diouf in the penalty area, although replays showed the foul took place just outside the area. Hull levelled the match midway through the first half, when former Sunderland player Elmohamady was given the time and space to drive an effort beyond Paddy Kenny from just inside the area. Six minutes later Hull were ahead after more good work from Elmohamady, his wicked cross finding Faye in space to head home at the far post. Hull made sure of the result late on when a swift counter-attack allowed Koren the opportunity to curl a third beyond Kenny. And while there was still time for Gray to find the target, it was too little, too late for Neil Warnock's men.